Looking out on a well-stocked pond with fishing reel in his hand, 2013 Chef to Watch Chris Wadsworth looks completely in his element. 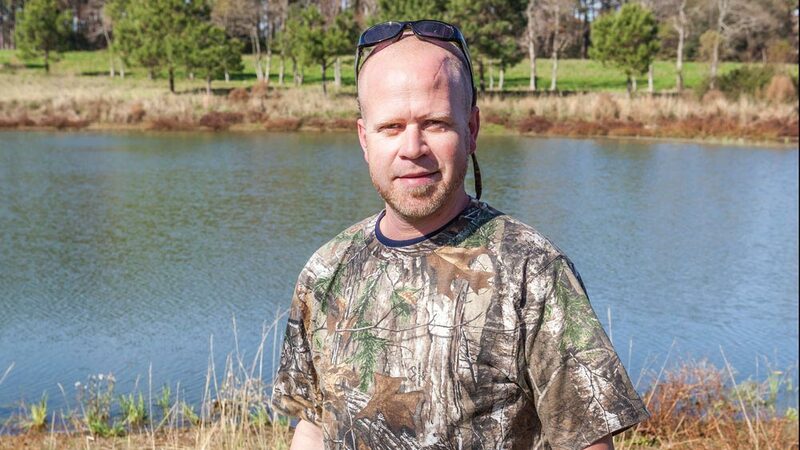 While he can’t get to his family’s fishing and hunting camp at Trinity Trace in Kentwood, Louisiana, as much as he’d like, he cherishes his time here. 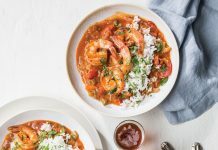 After a few minutes, he pulls in a decent-sized largemouth bass, cleans it, and heads back to the house to start a fish stock, the base and backbone of his camp-style crawfish etouffee. 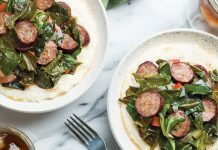 This sort of rustic, elemental cooking has always been central to Chris, and now he is able to practice it daily at his newest restaurant, Goûter, in Baton Rouge. At Goûter, just like at his camp, Chris uses a lot of cast-iron cookware, back-to-basics cooking with a fresh point of view, and no frills or fillers. This camp-style crawfish etouffee is Louisiana cooking at its best. What makes a great etouffee? First off, you want to make sure you’re not using any kind of cream or thickeners. There are a lot of “quick and easy” recipes now that call for cream of mushroom soup or cream of celery soup and those kinds of things. True etouffee to me is butter, a lot of veggies, a lot of crawfish, and crawfish fat. 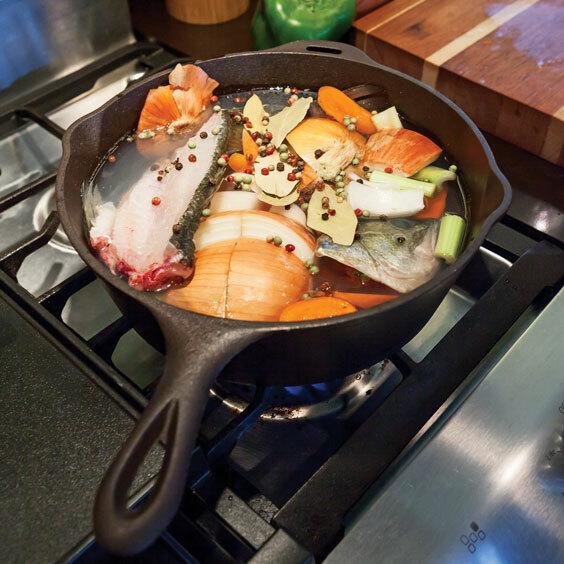 When I’m cooking it camp-style, I like to use a little bit of fish stock, because there are always fresh fish around, and in this one, I add a little whiskey because I’m already drinking some. 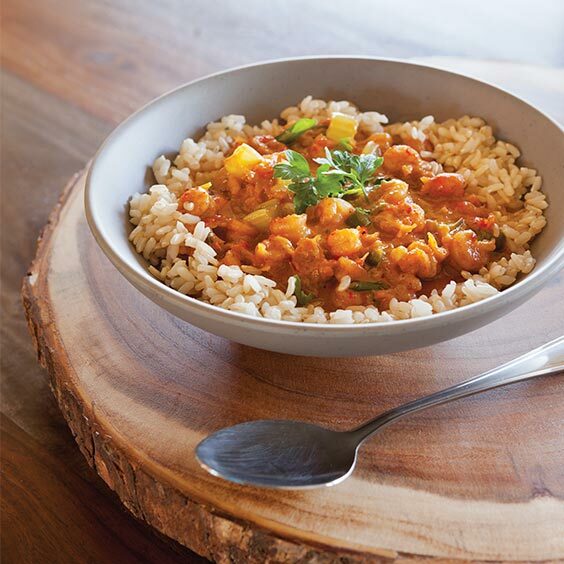 What would you pair with this Camp-Style Crawfish Etouffee? This is definitely a whiskey dish, so I’d say rye on the rocks, with maybe a splash of ginger ale. What tips would you give for someone who hasn’t made crawfish etouffee before? Use the crawfish fat. You’ve got to use the fat. A lot of people will drain out the fat that comes in the crawfish tail package, and the fat is where the flavor comes from. The other thing is about the butter. I like to sauté with some butter to get that flavor going, and that butter basically gets cooked all the way down. Once the veggies and crawfish are cooked the way I like them, I turn off the heat and let them sit for a few minutes. Then I start to work in the cold butter. 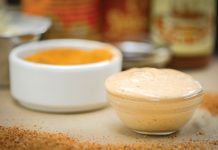 That gives it a nice creamy richness without having to use any roux. If you were going to boil all the crawfish for this camp-style crawfish etouffee, how many pounds would you need? The yield on crawfish tails is about 20 percent, so you’d need about five pounds of medium crawfish to get one pound of tail meat. What difference do you see between Louisiana crawfish tails and imported tails? There’s a certain greatness that comes with muddy crawfish, and crawfish that come from overseas can taste a little too clean. They also usually have a freezer-burnt taste to them. And the fat content isn’t there, not by any means. Tell us about the fish stock you use with this camp-style crawfish etouffee. The fish I used here was about 2 pounds. I took the fillets off, and put the rest in the pot, along with celery, onions, garlic, peppercorns, carrots, and bay leaves. And a little magic. You’ll notice I didn’t put any salt in it. I’m not a big salt fan when it comes to fish stock, or any stock for that matter, because I want it to taste like the protein. I don’t want it to be a salty mess. Also, I leave the skin on the onions. There’s no reason not to, and despite popular belief, there’s a lot of flavor in those onion skins. How do camp-style dishes fit in with your cooking philosophy? A couple of different ways. First of all, the average Louisiana person knows this style of cooking and loves cast-iron and camp-style dining. There are a good number of people here, though, who don’t usually cook that way, so I hope I’ll introduce them to some unique ways of eating traditional dishes. At Goûter, everything is in cast iron. I’m trying not to reinvent the wheel too much. I want to keep us grounded with local ingredients and base dishes around an ingredient or dish that’s been around for a long time, while throwing in a few modern twists here and there to make it my own. I’m a firm believer in trying not to reinvent Louisiana cuisine too much. We use as many natural, locally sourced ingredients as we can. Heat a 3-quart cast-iron Dutch oven over medium heat. Melt ½ cup butter, and add onion, bell pepper, celery, and tomato; cook until tender. Add garlic, and cook 2 minutes. Add crawfish (including fat), and stir to combine. 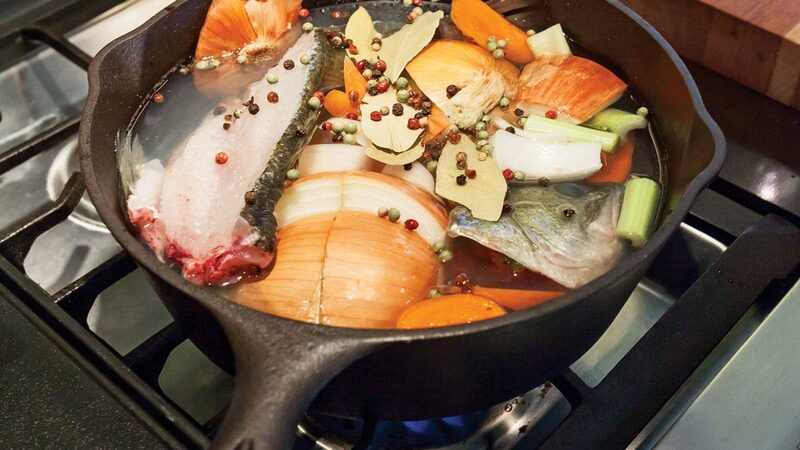 Add Camp Fish Stock and whiskey, and bring to a boil over high heat. Reduce heat and simmer until liquid is reduced by half, 15 to 20 minutes. Add salt, peppers, and hot sauce. Taste, and adjust seasoning, if necessary. Cube remaining 1 cup butter. Remove pan from heat, and fold in cubed butter; stir until a creamy sauce forms. Garnish with fresh parsley and green onion, if desired. Serve over hot rice. *For best flavor and texture, use Louisiana crawfish tails. Do not rinse fat from crawfish tails. We used Slap Ya Mama hot sauce. In a 2-gallon cast-iron pan, combine all ingredients. Bring to a boil; reduce heat, and simmer 45 minutes. Skim off any film that rises to surface. Strain mixture through a fine-mesh sieve into a large bowl; discard solids. Return stock to pan, and simmer until reduced to 2 quarts, about 1 hour. Use immediately, or let cool and refrigerate up to 3 days or freeze up to 3 months.